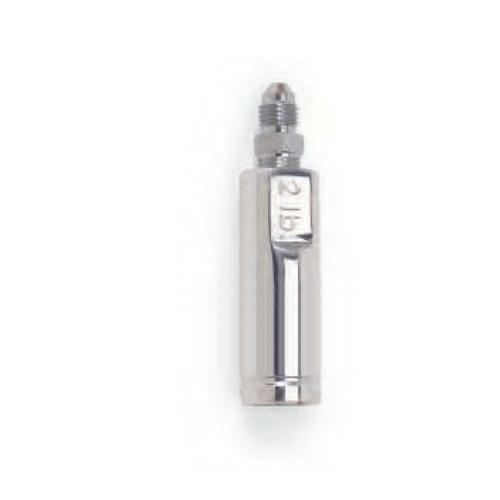 Russell brake residual valves eliminate spongy-pedal feel by retaining brake-line pressure and keeping your pedal firm. The valve stops brake fluid from draining back into the master cylinder; this keeps your caliper pistons and brake shoes from fully retracting so your brake system stays primed without brake drag. The result is a firmer pedal that engages quicker and provides increased braking response. These residual valves are polished for great looks and available in 2 psi for disc brakes & 10 psi for drum brakes; drums require more pressure to compensate for return spring tension.